Palm Beach...It conjures up so many vivid pictures in the mind. There's just no where else like it. It's one of those unusual, rare, larger than life locales that simply can not be replicated. I have been lucky enough to spend a good bit of time on the island in the last 8 years - time that has inspired me profoundly. The painting below came to be after a once in a lifetime commission for a client on Palm Beach. When I start a commission I generally need and prefer vague guidelines like size, color direction and samples of my work the client is drawn to. This client was different. They had some specific requests and I think we accomplished all 6 ft by 9 ft of them! They wanted some recognizable beach elements with some meaningful places highly abstracted so that my clients hold the secret meaning of nearly each and every brush stroke in the painting. It's almost like a treasure map that only they can decode. Right up my alley! 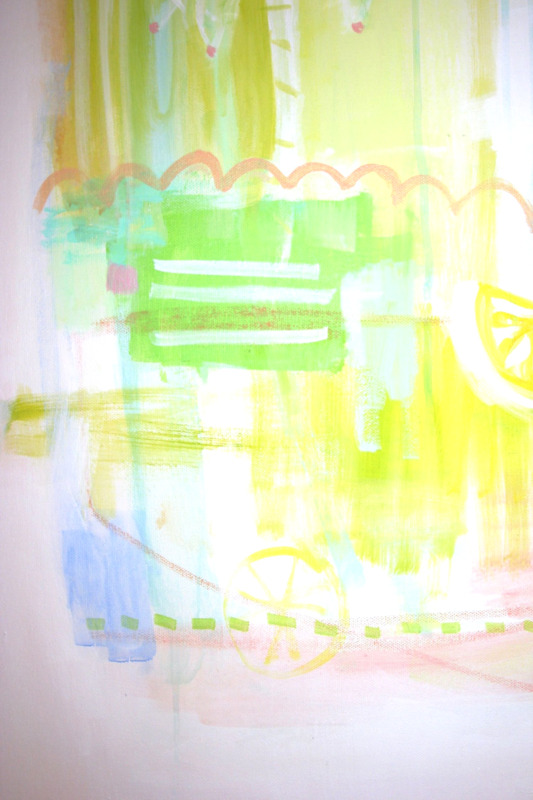 The piece was to be quintessential Palm Beach pastels with a LIlly Pulitzer feel. This was unlike anything I have ever done before but it was fun to reach back to my whimsical illustrative days and combine it with my love of abstract expressionism.